Have you ever seen those little crosses made using real palm fonds and wonder how they did it? This is a tradition in many churches to distribute these to the congregation on Palm Sunday. It’s also a memorable craft for children’s Sunday School. This is a craft idea we tried once in our children’s church. It took some real patience and was difficult for younger children. An easy alternative for them would be using glue to make the cross shape. Otherwise, here are a few videos that describe this craft idea. 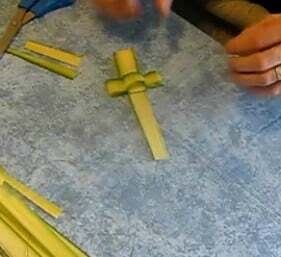 This Palm Frond Cross craft project would work best in older elementary or youth Sunday School. Even a moderate size class could fold enough crosses to hand out after Sunday School to the whole congregation. Those videos should give you a rough idea of how to process. For printable directions I recommend this webpage. It has easy to follow instructions for folding this Palm frond cross.